lightning current arrestors OBV8 meet the type 1 requirement class according to IEC 61643-11. These devices protect low-voltage consumer systems from overvoltages of all types and are available in single-pole to four-pole versions.The voltage-limiting,high-performance spark gaps provide several benefits.A short response time, a low protection level and high current leakage capability with long service life. WenZhou Chuangjie Lightning Protection Electrical Co.,Ltd professional designs and manufactures highly reliable, industrial grade, TVSS (transient voltage surge supressors) surge protectors that guard sensitive equipment from damage. AC Power Line, Data Line, Low Voltage SPDs,lightning rods,Varistors. Since 1999, CUAJE® continues to be intensely dedicated to one area - the design, development and manufacture of highly reliable surge protection devices (TVSS, SPDs). Products you can depend on when it counts. Lightning and power surges can seriously damage or disrupt operations in hospitals, financial institutions, military installations and other mission critical activities. 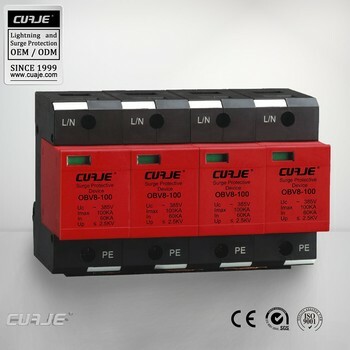 CUAJE® Surge Protection's attention to design and manufacturing offers extraordinary surge current diversion capability, reliably protecting sensitive systems from damaging transients, downtime, and its associated financial and labor costs. A: Yes, Sample orders welcomed. Q: Can I use my own Logo or design on goods? A: Yes, Customized logo and design on mass production are available. Q:What is the delivery time? A: 3 days for samples, 7-15 days for mass production. Q: What is the payment term? Q: Can I trust you? A: Absolutely YES, We are “Alibaba” verified supplier for many years. Q: May I visit your factory? A:Sure, welcome any time. We can also pick you up at airport or station. Wenzhou Chuangjie Lightning Protection Electrical Co., Ltd.